From my time living in Australia, lamb has become one of my favorite meats. Unfortunately it is very expensive in Canada, but you can get a nice 2 kg roast from Costco for about $30, still a bit pricey, but not unreasonable. 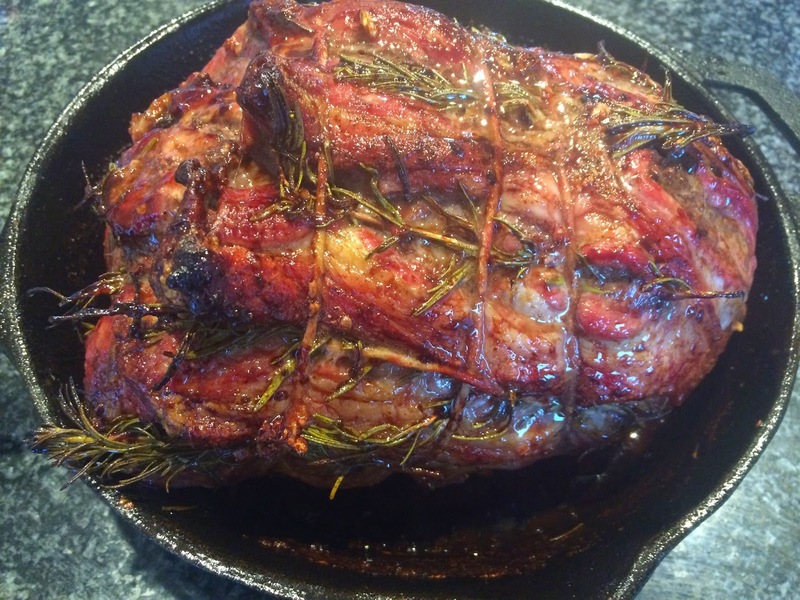 Lamb is such a tender meat, and so flavorful that you are best to limit any recipe using it to a few simple ingredients, too many and your just smothering it unnecessarily. As a general rule, excluding salt and pepper, I find that three to five are plenty. 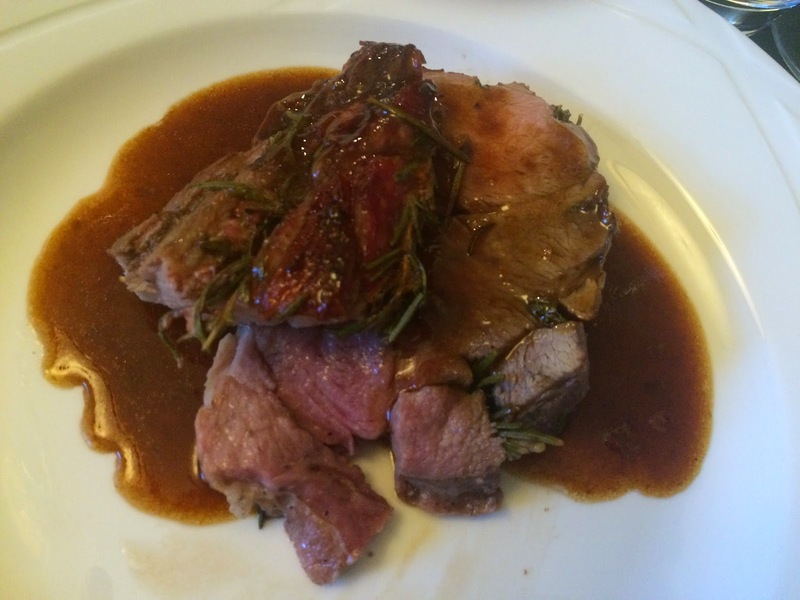 I often cook lamb with rosemary, always with garlic, and sometimes with wine. I had not yet tried it with a beer. I chose a red ale because I wanted something with a strong enough flavor, light hops and a good malt. Something that would seep into the meat and make a flavorful gravy, without drowning out the natural flavors of the lamb. Toolshed Brewery’s Red Rage was a perfect choice, it caramelized so beautifully as it reduced in the pan and the resulting au jus had a flavor punch that a less hoppy beer may have lacked. 2) Remove the lamb from its netting and unravel. Rub garlic, salt and pepper over entire roast, ensuring it is well covered. Put more salt on areas where the meat is fatty, this will help crisp the fat. 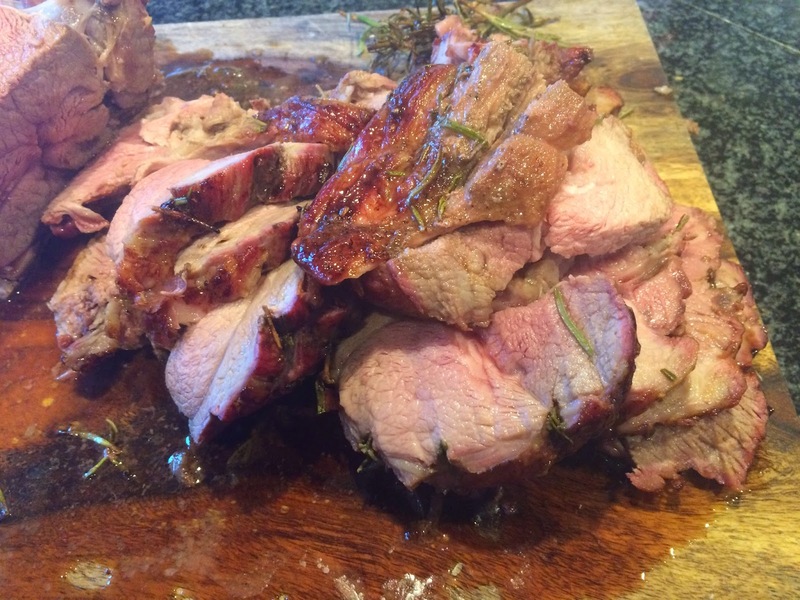 remove leaves from one rosemary sprig and sprinkle over the inside of the roast. 3) Roll the meat back into its original shape, fat on the outside, and score 8-10 long slices into the fat, about half a centimeter deep and a centimeter apart each. Place a whole rosemary sprig in each cut. 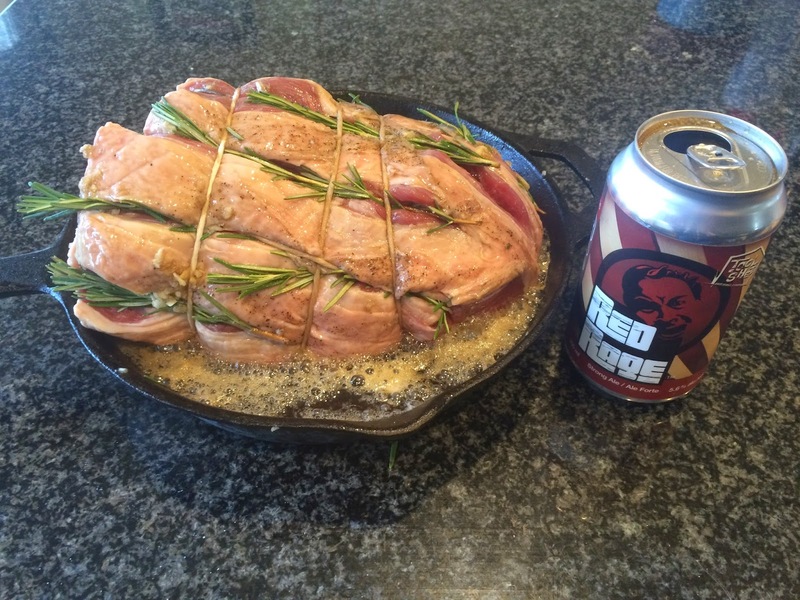 4) Using butchers twine, tie the roast up tightly, making sure you keep the rosemary in its place. 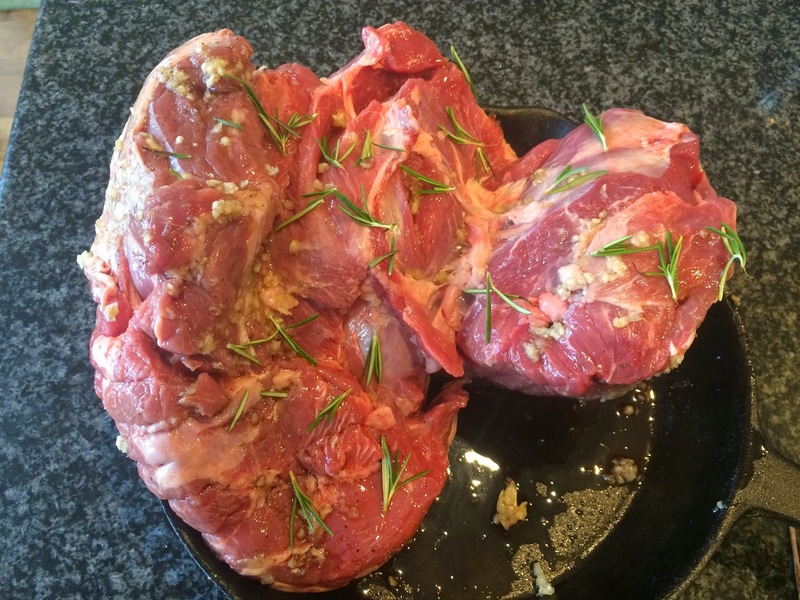 Here is a great video on how to tie a butchers knot if you have not tied a roast before. Normal knots are fine too, but this will ensure the roast is nice and compact. 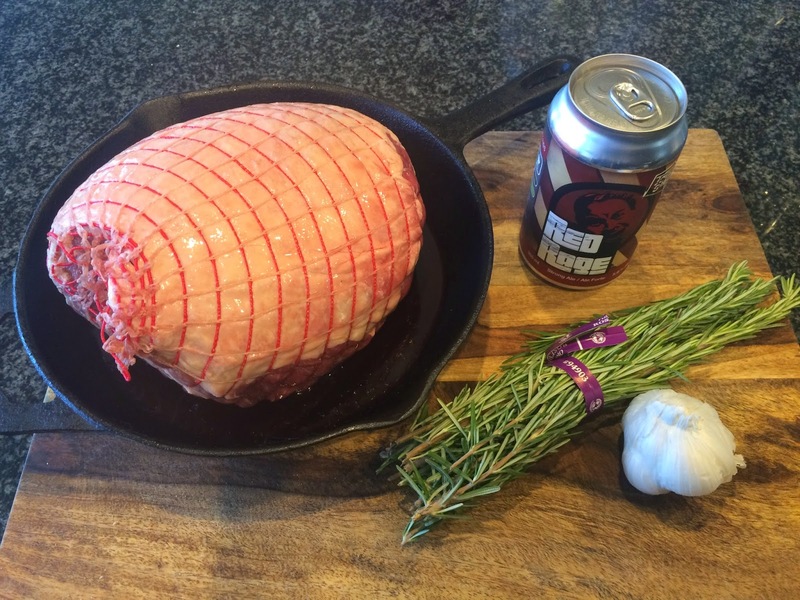 5) place roast into a cast iron saucepan and pour beer into bottom. 6) BBQ at 400 degrees Fahrenheit for 1 hour 45 minutes for medium rare (if tested with a meat thermometer, it should be approximately 145 degrees Fahrenheit). After an hour, the beer will have thickened and you can start basting every 10-15 minutes. 7) When cooked, remove the meat from the saucepan and leave to rest for 5-10 minutes. 8) Set the saucepan of pan juices at a medium heat and add the beef stock, sugar and salt and pepper, bring to a simmer. 9) In a small bowl, combine the cornflour with the water and mix until smooth. 10) Add cornflour water to the pan and whisk until lightly thickened. It should be the consistency of a watered down gravy. Carve the lamb in to generous pieces and serve with a couple spoonfuls of the au jus. Previous CanMORE food even fit in our bellies! ?